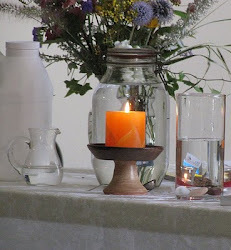 Some Unitarian Universalists have chosen to walk on the path of the spirit. They have left the path of the ego. 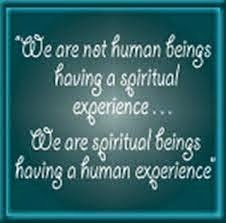 How can you recognize UUs who are walking the path of the spirit? They manifest certain signs, one of which is patience. 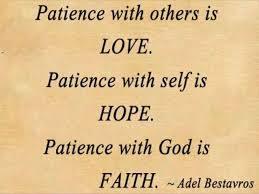 This patience is not the same thing as denial or avoidance or passivity or ignorance. This spiritual patience is based on trust and faith in the ultimate outcome of salvation, the At-One-Ment, what some might call "cosmic consciousness" or "God consciousness." Another milestone on the the path of the spirit is patience. "Patience is a virtue" is an old cliche which people like to quote because it is so hard, at times, to practice. Once on the path of the spirit, the outcome is known. The outcome of human evolution is the At-one-ment. The Atonement is when everybody loves everybody all the time. It may seem like a long way off but the trust and faith in its ultimate achievement can help a person practice what seems like infinite patience. The goal is assured. It is only a matter of time. Some people are slower learners than others. Not everyone learns at the same pace. It says in the introduction to A Course In Miracles, "It is a required course. Only the time you take it is voluntary. Free will does not mean that you can establish the curriculum. It means only that you can elect what you want to take at a given time." We are all in this thing called Life together. Life provides us with a series of lessons if we are to survive in our present incarnation. The lessons about our physical functioning are the easiest to learn when we are small children. The lessons about our emotional functioning are more difficult to learn and can take a whole life time. The lessons about our spiritual functioning for many are never learned but for some, who are willing to examine their lives, lessons can be learned culminating in enlightenment. One of the milestones on the path of the spirit is the learning of patience. There is no need to hurry. Learning cannot be forced. People cannot be pressured into learning their lessons. The person has to choose when they will learn and even if they will learn. Some people learn quickly the lessons Life is teaching and others don't seem to pay attention and learn much at all, and continue to make the same mistakes over and over again. The spiritually advanced soul is patient, gentle, defenseless, nonjudgmental, joyful, honest, and trusting. It is the trust born out of faith in the eventual certainty of the Atonement that generates patience. In traveling the path of the spirit, the traveler finds peace and this peace is imbued with patience. Barry letting Sam get in line in front of him at McDonald's left Heather feeling even more attracted to him though she still had doubts if he was the one.